ANSI escape codes allow you to perform a range of manipulations in console applications. They allow you to do things such as move the cursor around, displaying text in different colours, display text in bold, underline, etc, as well as various other things. 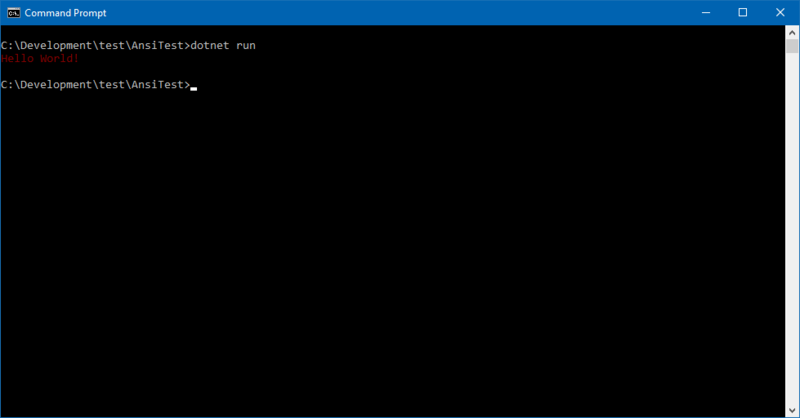 In this blog post, I will look specifically at the colour codes and how you can use them in .NET Core console applications. I will also discuss why you should probably avoid using them - especially when developing applications for Windows. Update on 22 October 2018: Manuel Riezebosch notified me of a library he wrote called Crayon that wraps the techniques I describe in this blog posts. Please check it out if you want to use these techniques. ANSI escape codes are character sequences which you can print to the terminal (or console) window to give the terminal certain instructions. As discussed in the introduction, it allows you to perform various actions in the terminal, but for now, we’ll focus on the use case for printing text in specific colours. To tell the terminal to switch to using a specific colour we need to send the escape sequence for that colour. Let’s say, for example, that we want to switch the terminal foreground colour to red, we can write the escape sequence ESC[31m to the terminal. Escape sequences for colours always start off with ESC[, followed by the number for the colour, in this case, 31, which is red. Finally, we need to close off the sequence with m.
Any text following this will now be printed in red. Finally, you will probably need to reset the colour and for that, you will write the sequence ESC[0m to the terminal. I strongly recommend that you also read Build your own Command Line with ANSI escape codes. It contains a lot more in-depth information on using ANSI codes. Let’s put this in practice with an elementary .NET application. The sample code below writes the escape sequence for red, followed by the text Hello World, and finally the escape sequence to reset the terminal colours. Note that, the ESC Unicode character is 001b (see here), and in C# we specify Unicode characters as \uxxxx where xxxx is character code. 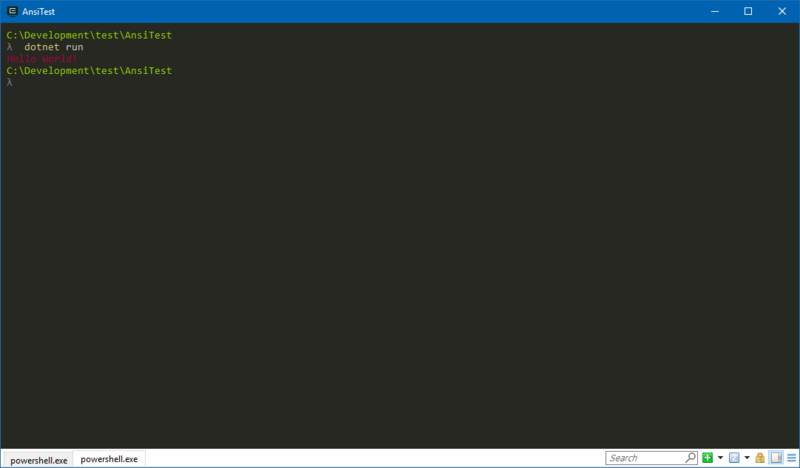 Therefore, to write the escape sequence ESC[31m in C#, we need to write \u001b[31m to the console. It turns out that ANSI escape sequences are not properly supported on Windows. While they will work fine on other platforms such as macOS and Linux, using them in the Windows is problematic. In the first screenshot, I used Cmder, which uses ConEmu, which in turn interprets these escape sequences correctly. Further investigation revealed that Microsoft did, in fact, start adding support for ANSI escape sequences in Windows 10 version 1511 (Threshold 2). It is, however, not enabled by default and you will need to explicitly enable it in your application. So this leaves the question: Should you use it? Unless you have exact control over the environment in which your console application will be running, it probably is not worth taking the risk that it may not work on some users’ computers. 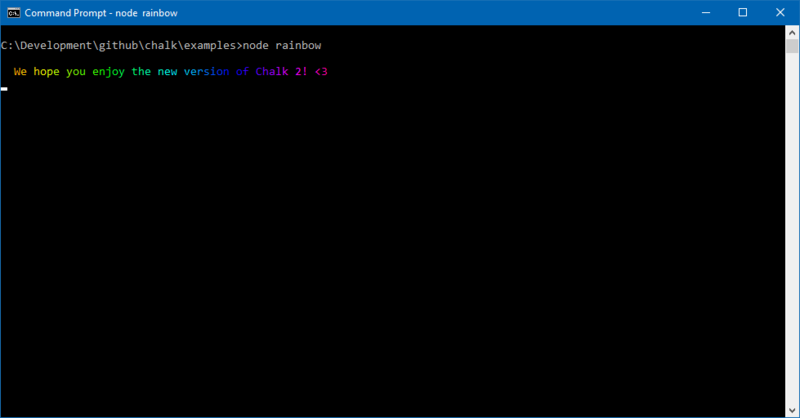 So, for now, if you want to use nice colours in your .NET Core console applications, it is probably best to stick to using Console.ForegroundColor and Console.BackgroundColor to manipulate colours in your console applications. Looking through their source code I also could not find any specific accommodation for Windows, so I was initially a bit stunned as to why this works on Windows, but doing the same thing from my C# applications does not work. 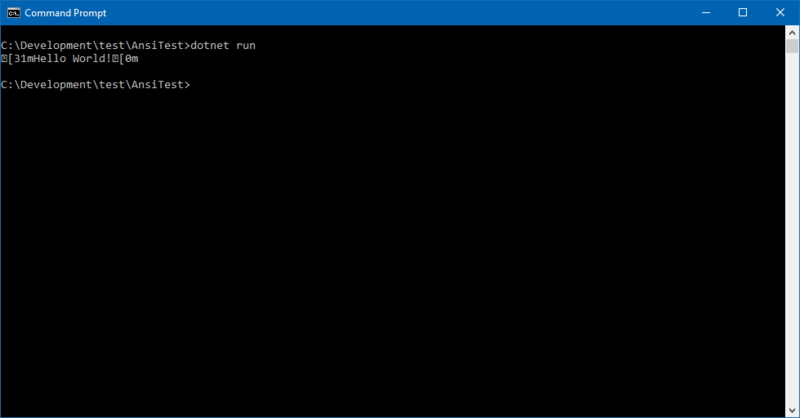 It turns out that Node.js actually provides a proxy layer in Windows which will emulate the ANSI escape sequences correctly when Node.js applications run on Windows. It would be cool if Microsoft could do the same sort of thing, to enable us .NET developers to more confidently use the ANSI escape sequences on Windows, wouldn’t it?